Centre for Islamic Economics, Banking and Finance at School of Economics and Business in Sarajevo (Bosnia and Herzegovina) is pleased to announce a „Call for expression of interest“ for the new generation at Islamic banking Master study for the academic year 2016/2017. Call for applicationas will be announced in following months, but due to the limited number of places an early expression of interest is strongly recommended, especially for international students. Candidates who express their interest will receive feedback instantly after June 30th, 2016. Successful candidates will be given opportunity to enroll MA Islamic banking, and will have more time to plan their admission and other activities regarding enrollment into this Master study. Tuition fee is 7,158.50 EUR per year. Students will obtain joint MA diploma: from University of Bolton (United Kingdom) and University of Sarajevo (B&H). Studies are practice oriented and are organized in partnership with Bosna Bank International in Sarajevo, which enables students to acquire practical Islamic banking knowledge during internships. The classes will start in October 2016. More information about this master study can be found on this link: http://www.efsa.unsa.ba/ciebf. It is important to note that all documents must be written in English languageotherwise will not be considered. Required documents can be submitted by e-mail ciebf@efsa.unsa.ba or regular/land mail at the following address: School of Economics and Business Sarajevo, University Sarajevo, Centre for Islamic Economics, Banking and Finance, Skenderija 70/II, 71000 Sarajevo. The goal of the „Islamic Banking“ master's degree programs, which is carried out as a collaboration between the School of Economics and Business Sarajevo (Bosnia and Herzegovina) and the University of Bolton (UK), is to acquire additional knowledge from the field of Islamic Banking and Finance. Studies are practice-oriented and they are intended for the managers of all levels in the banking sector, banking professionals and BA graduates (the First Bologna cycle students), who plan to work in the banking sector in the future, particularly in the field of Islamic Banking as the fastest growing segment of the banking industry. Studies are carried out entirely in English language. This master's degree program lasts two academic years (four semesters), and is worth 120 ECTS points in total. Applicants for this program can be the candidates that have already completed the undergraduate studies (which can last either three or four years), and have attained the equivalent of 180 ECTS or 240 ECTS, respectively. Upon the completion of this program, students may continue their education and apply for a PhD studies (the Third Cycle), in compliance with the Bologna model of higher education. Studies are expected to last two years (120 ECTS) in total, including the defense of the final paper called MA thesis. The curriculum consists of 12 obligatory courses (first, second and third semester) and 2 courses related to the professional practice - Internship (in the first and second semester). Each course is consisted of 30 hours of in-class lectures, which are worth 6 ECTS, meaning 90 ECTS in total. The final paper will be prepared after all of the courses have been passed and it is worth 30 ECTS. Lectures will be held by relevant professors from the School of Economics and Business Sarajevo, University of Bolton, as well as from the other universities from Bosnia and Herzegovina and abroad. The lectures will be held in Sarajevo. For each cohort of students, an agreement is signed between the School of Economics and Business Sarajevo and the University of Bolton. All issues related to the coordination of studies are stated in the Agreement, as well as some details related to the academic titles and diplomas acquired upon the completion of these studies. 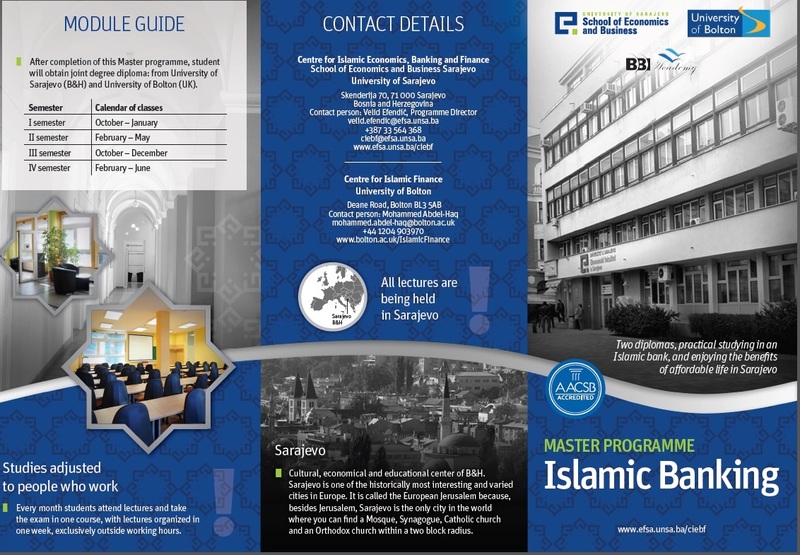 These Islamic Banking studies at the School of Economics and Business Sarajevo are the only one of this kind in the whole region of the Central and Southeast Europe. We have a full confidence that this program will enable its students to acquire new and different skills and competences. At the same time, these studies are creating conditions for the students to find a job in a comparatively shorter period of time and to start a successful career in the banking industry.